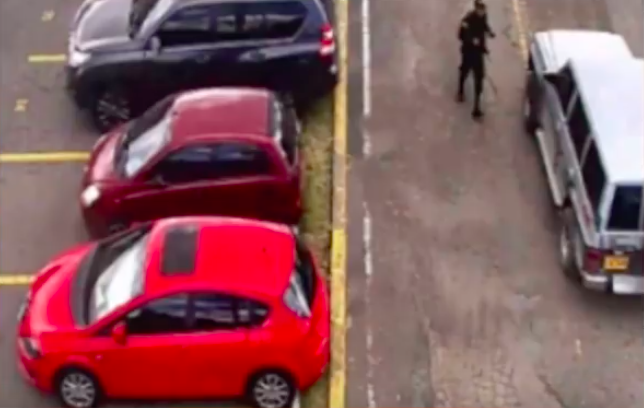 At approximately 9:30 in the morning on Thursday, January 17th 2019, a suicide car bomb (SVBIED) detonated inside the General Santander National Police Academy, located in the Southern part of Colombia’s capital Bogota. The explosion killed at least 21 people, and injured 68 more. After an initial investigation, the Colombian government blamed the revolutionary Marxist guerrilla group ELN (Ejército de Liberación Nacional, or ‘National Liberation Front’ in English), who have been fighting the government since 1964. On January 21st, four days after the blast, ELN issued a statement in which it claimed responsibility for the attack, stating that the police academy was a legitimate military target and that the attack was a response to alleged ceasefire violations by the government. The explosion was the deadliest car bomb attack in the country’s capital since 2003 when FARC detonated a car bomb outside the El Nogal Club – killing 36. FARC signed a peace deal with the Colombian government in 2016, and since then ELN has been stepping up their anti-government attacks. Thursday’s attack took place amid stalled peace talks in Cuba, that were subsequently called off by Colombia after ELN took credit for the attack. Now, the Colombian government has demanded that Cuba extradite the 10 ELN negotiators present for the now-cancelled peace talks. 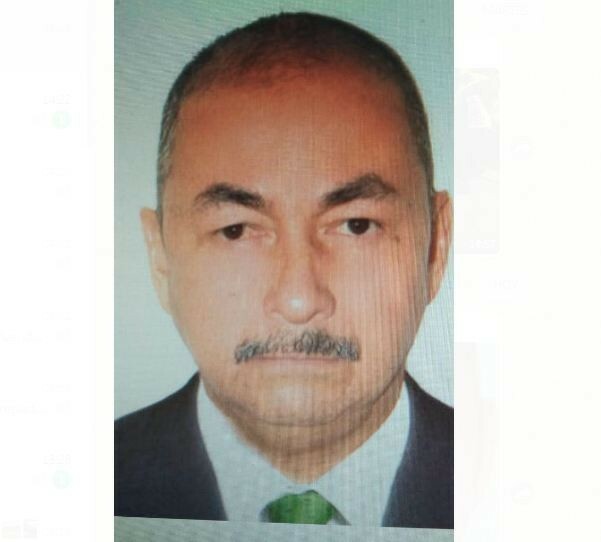 Using finger prints from his left hand, Colombian investigators identified the bomber as José Aldemar Rojas Rodriguez, a 57-year old high-ranking ELN figure and explosives manufacturing expert who had been part of the group for more than 25 years. Rojas Rodriguez had allegedly lost his right hand in an explosives accident a decade ago – giving him a distinctive look and the nickname “El Mocho”. Rojas Rodríguez had been a part of the ELN’s powerful “Domingo Laín Sáenz front”, serving as an active militant in Pueblo Nuevo in the north-eastern Arauca region that borders Venezuela. 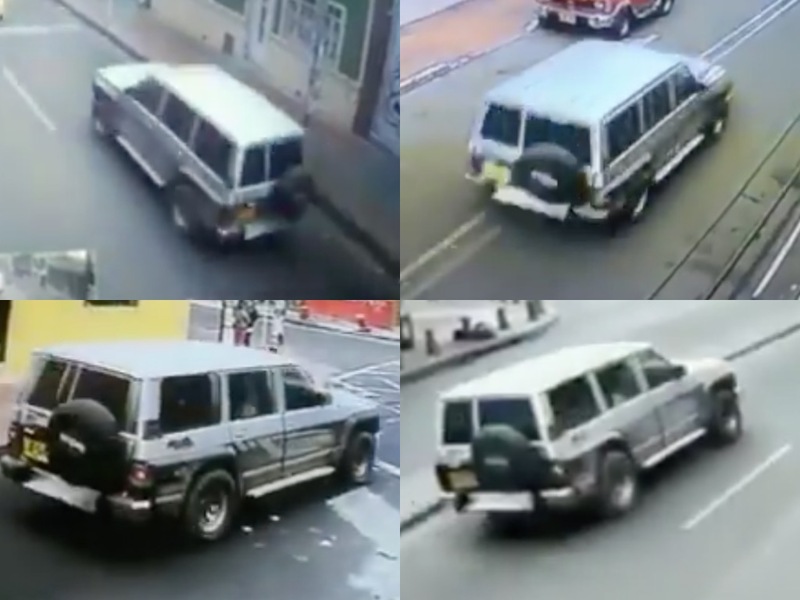 The vehicle used in the Bogota attack was a 1993 Nissan Patrol that Rojas Rodriguez purchased in the Arauca region on May 11th 2018 for the equivalent of $8000. The payload that would later be fitted to the SVBIED consisted of 80 kilograms of pentolite, a composite high explosive (PETN mixed with TNT) used in military warheads and booster charges. It’s possible that ELN militants may have extracted pentolite from unexploded ordnance left over from the drawn out campaign of air strikes against the different Colombian insurgent factions. Seeing as the Arauca region is situated approximately 700 kilometres from Bogota, it’s very likely that Rojas Rodriguez and his fellow ELN cadres transported the Nissan SUV to a safe house inside Bogota city in order to rig the wiring and explosives. 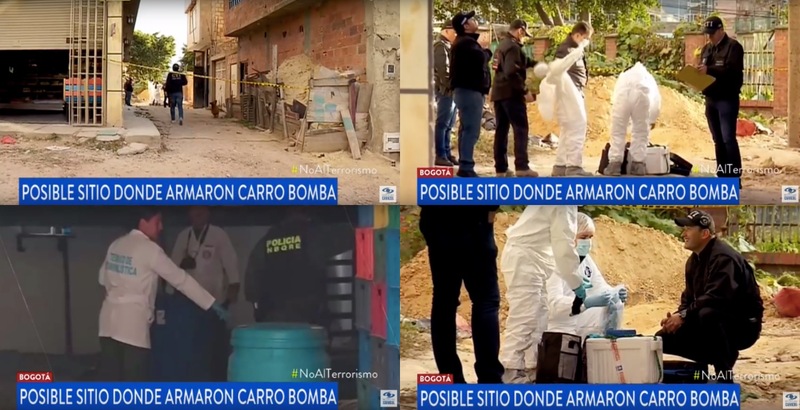 In fact, Rojas Rodriguez had rented a “bodega” in the Santa Librada neighbourhood of the Usme suburb approximately 11 kilometres south of the police academy in Bogota less than a month prior to the attack, in which the SVBIED was prepared. 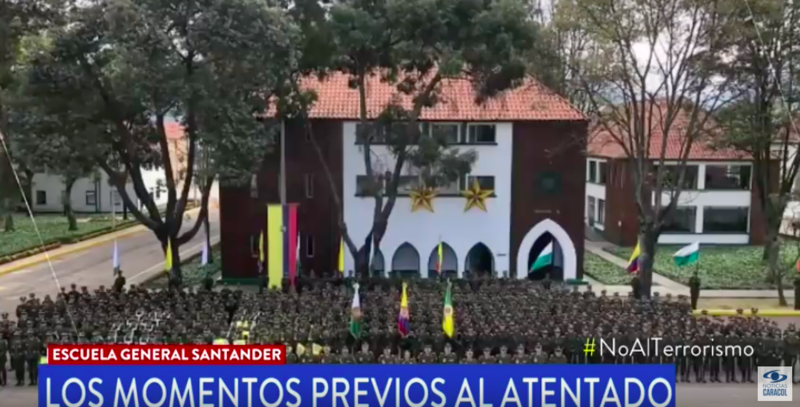 The General Santander National Police Academy (Spanish: ‘Escuela General Santander de la Policia Nacional’ or ‘ESCAN’) is the main educational centre of the Colombian National Police, and is located in southern Bogota. ESCAN functions as a sort of university, and has a large campus with multiple dormitories, faculties, and training facilities. As such, it is a very high-profile target for Colombian non-state actors such as ELN wishing to strike a blow at the heart of the police. As Rojas Rodriguez departed from the ELN safe house in Santa Librada with a passenger in his SVBIED slightly after 9 in the morning on the 17th, he approached ESCAN from the south. In the 15 minutes between 9:15 and 9:30 that it took to reach his target, his 1993 Nissan Patrol was spotted by more than a dozen CCTV cameras along the route. Interestingly enough, the SVBIED was followed the entire route by a motorcycle carrying a man and a woman with a pink shirt. 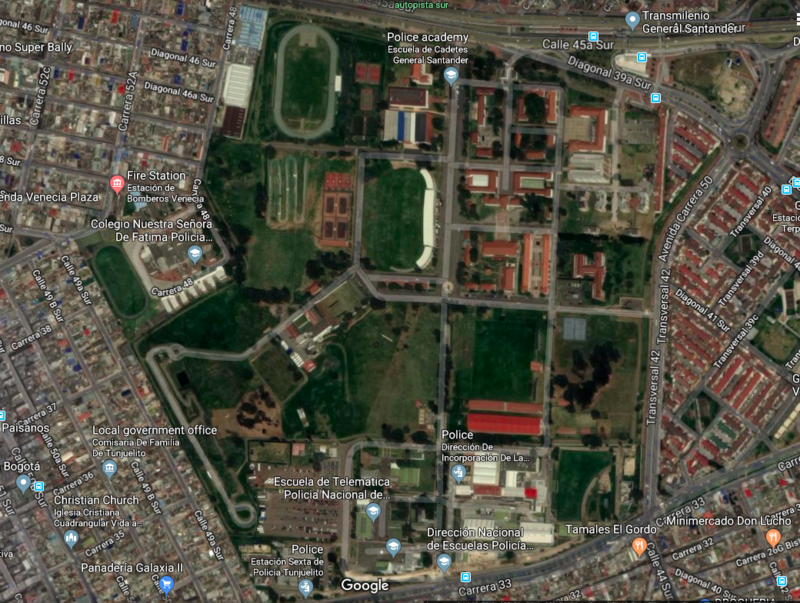 As the SVBIED began approaching ESCAN from the west, it stopped briefly near the Transmilenio Alqueria bus station, located just 350 meters from the main northern entrance of the police academy. 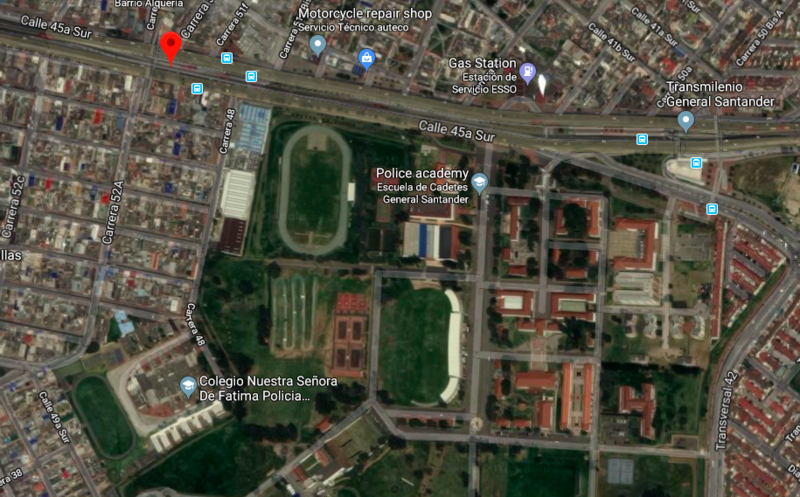 The passenger jumped out of the car, before Rojas Rodriguez continued his drive eastbound down “Calle 45a Sur” (Road 45a South), arriving at the main northern entrance to ESCAN that connects to the compound’s wider parade street. It’s possible that either the passenger or the people on the motorcycle were equipped with a remote detonation device, which would have allowed them to detonate the payload from afar in order to ensure a successful attack. The northern part of ESCAN has three entrances, visible in the below picture. The main northern entrance is the middle one (B), while the SVBIED was last seen on CCTV footage near entrance A – a side entrance usually reserved for cargo traffic. 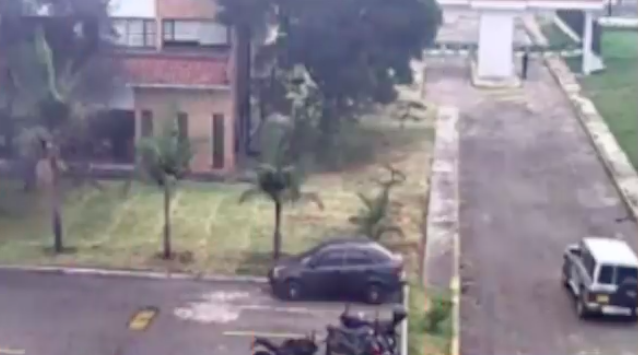 According to Peruvian newspaper “El Comercio”, explosives sniffing dogs detected the SVBIED payload as Rojas Rodriguez attempted to pass through the side entrance (A), after which he ran over a guard and entered the compound. 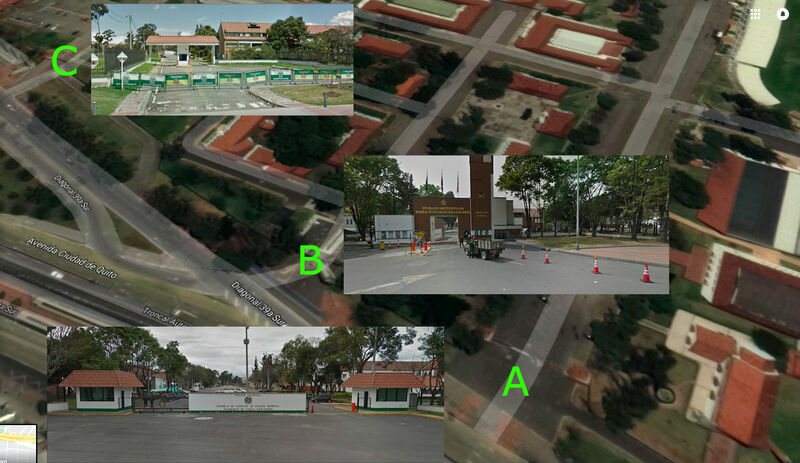 However, according to new details revealed by the newspaper “Noticios Uno”, Rojas Rodriguez was able to drive through the checkpoint unhindered due to a lack of rigorous security, as the only defence present were plastic cones. Apparently, there was also a technical fault with the retractable metal gate, rendering it inoperable. After Rojas Rodriguez’ passed through the northern side entrance (A), security guards reported on their radios that a vehicle had made an unauthorized entry into ESCAN. 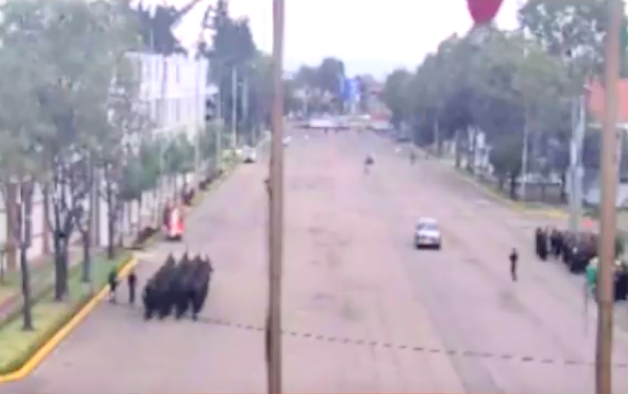 CCTV stills from inside ESCAN shows the SVBIED driving down the wide parade street after having entered the compound through entrance A a couple hundred meters to the north – passing by groups of dozens of police cadets marching in formation. A single still image from a surveillance camera doesn’t say a lot about the speed of the vehicle, but it doesn’t appear as if anyone breaks formation as the vehicle passes, except for a single officer that looks as if he’s approaching the vehicle from the right. It’s unlikely that most people had any idea of what was going on at this point though. While the security guards had reported the unauthorised entry over their radios, it doesn’t seem like they were aware of the true nature of the vehicle. 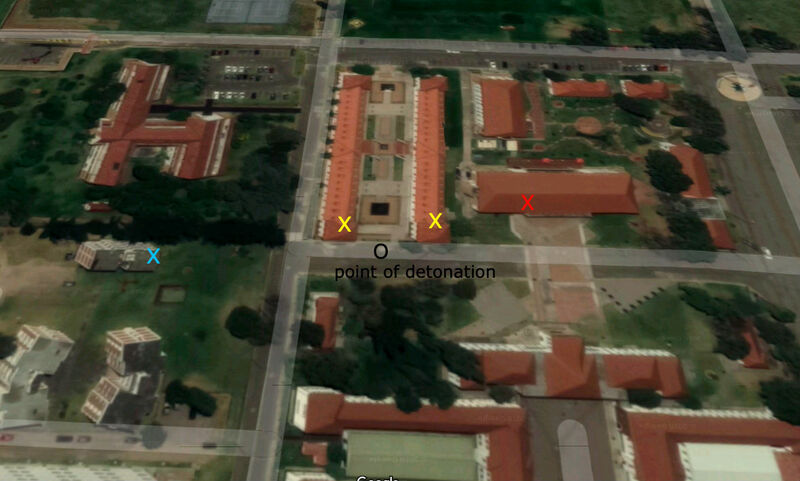 The fact that Rojas Rodriguez didn’t instantly swerve into the crowds of marching cadets and detonate his payload is a good indication that he already had a specific target inside ESCAN in mind. Interestingly enough, Rojas Rodriguez entered ESCAN at the same time as a graduation ceremony of hundreds of police officers and cadets was taking place on the academy grounds. It’s likely that this large gathering of police was the real target of the SVBIED attack. After passing by the marching police cadets, Rojas Rodriguez continued driving down the parade street, before turning left and aiming for the exit located on the eastern side of the compound. As he approached the checkpoint, a guard armed with an assault rifle walked up to his vehicle, questioning where he was going. The fact that he attempted to leave the premises indicates that he was unable to locate the intended target and wanted to abort the mission. This also decreases the likelihood that the attack was planned as a suicide mission at the outset. After being confronted by the armed guard, Rojas Rodriguez reversed his vehicle, and in a panic sped off back into the sprawling compound. In realizing that he had been detected and hence was unlikely to be able to get away unscathed, he turned right, and then a quick left, before crashing into a wall in a panic, detonating his payload next to a group of police cadets, killing at least 20 of them (all aged between 18 and 23) and injuring 68 more. All together, Rojas Rodriguez only spent around 40 seconds inside ESCAN before detonating. If Rojas Rodriguez had continued driving straight after doing a right turn after reversing from the exit, instead turning left on the next street, he would have found the location of the intended target where more than 200 police officers and cadets were participating in a graduation ceremony. 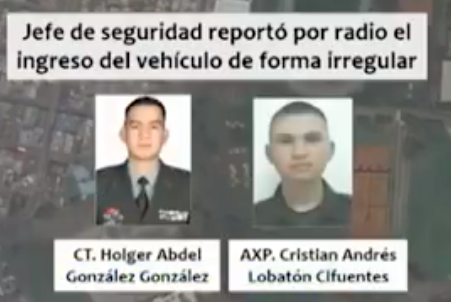 At this point, it’s unclear who the person was that Rojas Rodriguez dropped off near the TransMilenio bus station prior to executing the attack, or who the pair on the motorcycle were. 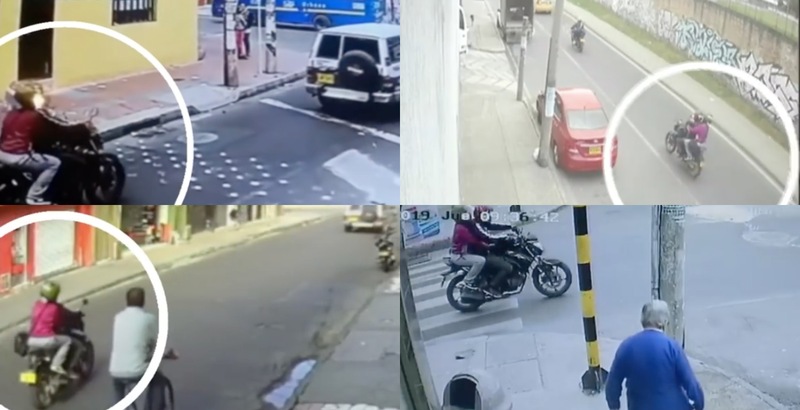 It’s possible that It’s possible that either of them were equipped with a remote detonation device, and the proximity of the bus station to the police academy, as well as the mobile characteristics of the motorcycle, increases the likelihood of that. Utilising remote detonation as a last resort is a common feature among many groups that utilise SVBIEDs, and is not at all a far-fetched idea. 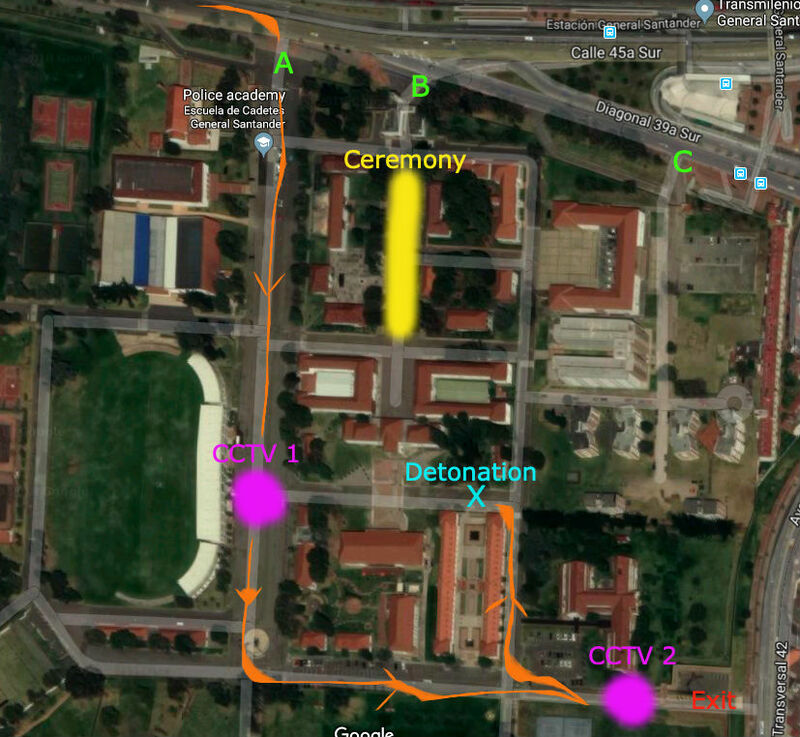 If the plan was that Rojas Rodriguez was supposed to park the vehicle near the graduation ceremony before slipping away, it would make sense for someone to remotely detonate it after a given amount of time so as to ensure that the VBIED would explode. While the January 17th VBIED attack was likely originally planned as a parked VBIED attack on a graduation ceremony of hundreds of police officers and cadets inside ENCAS, Rojas Rodriguez failed to locate the target, attempted to leave the compound, was confronted, and subsequently detonated his payload as a last resort near a smaller gathering of police. However, the blast site was eerily close to the graduation ceremony, where hundreds of police officers and cadets were present. It appears as if an even bigger catastrophe was just narrowly avoided by chance. Around 45 minutes after the attack, a suspicious phone call was intercepted. 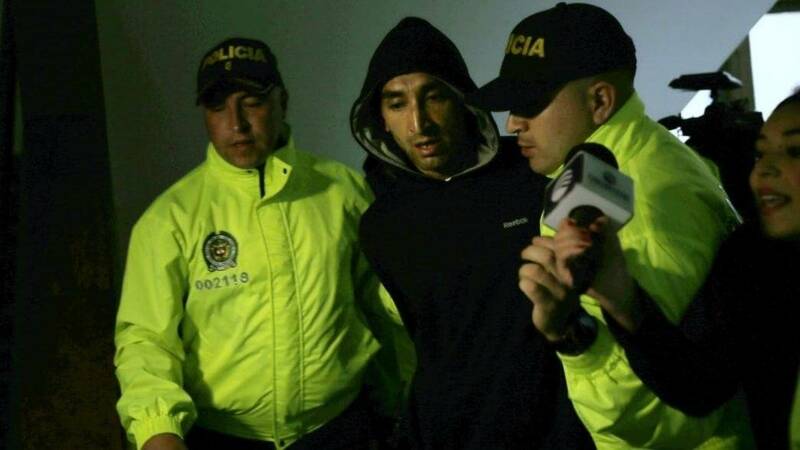 At approximately 2:30 in the morning the next day, Colombian police arrested an alleged accomplice, 39-year old Ricardo Andrés Carvajal Cortés, in the Los Laches neighbourhood in central Bogota. An excerpt of the intercepted phone call read as “Pues no ve que pusimos la bomba en el General Santander y tocó venirnos a encaletarnos”, which roughly translates into “Don’t you see we put the bomb in General Santander and now we had to come for hiding”. 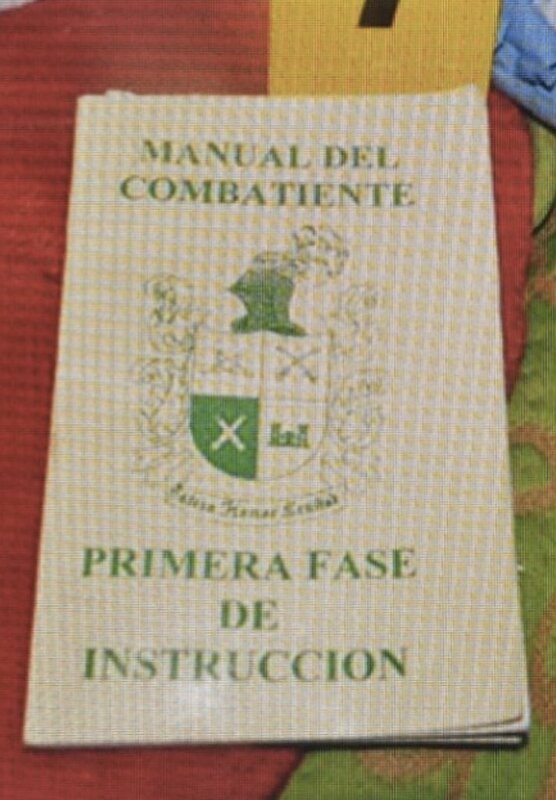 At the time of his arrest, Carvajal Cortes also had a Colombian Army training manual on him, titled “Manual Del Combatiente – Primera Fase de Instruccion”. Since then, Carvajal Cortes has been charged with aggravated homicide and terrorism. At this point, it’s unclear whether Carvajal Cortes was the passenger that Rojas Rodriguez dropped off before conducting the attack, the man on the motorcycle, or if he’s connected to the plot in a different way. Colombian police also managed to locate the “bodega” in Santa Librada where the SVBIED had been prepared. While forensic technicians failed in locating any explosives, they found industrial fire extinguishers that “could have been used in order to condition the explosive device”. CCTV footage that filmed the SVBIED as it made the journey from the safe house in Santa Librada to ESCAN caught a glimpse at what could have been a part of the payload. While the 1993 Nissan Transport had tinted windows, what looks like a white plastic jug or barrel is visible through the rear passenger window on the right side. It’s highly likely that Rojas Rodriguez and his fellow ELN cadres had somehow received intel about the graduation ceremony, and decided to conduct the attack on January 17th because of that. 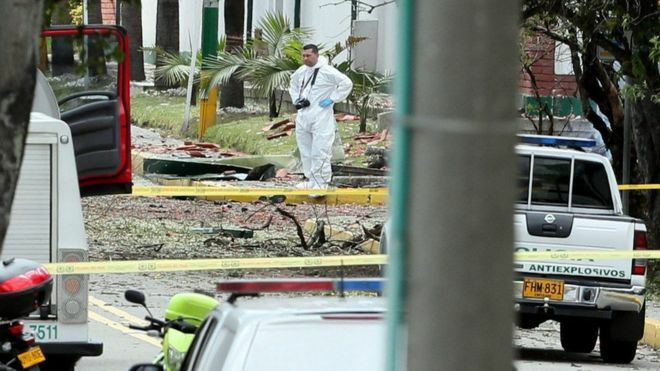 In the past, Colombia has had a long history of car bombs detonated by Escobar’s (and other cartel) ‘sicarios’, the use of a suicide car bomb (SVBIED) whether intentional or not, is an entirely new phenomenon in Colombia, and South America as a whole. Big thanks to Twitter user @AbraxasSpa for helping out with information.